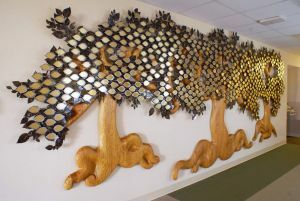 LEAVES OF LIFE have been installed at Hays Medical Center, (for the Cancer Center), Hays, Kansas. This project is to remember and honor people whose lives have been affected by cancer. The three tree shapes were hand-carved out of laminated oak by James Mages in his home then transported and assembled on site. Approximately 3,000 leaves were cut out to form the leaf clusters for the background. 600 of those leaves were polished and then welded on top of the background leaves. And then the GOLD Leaves were attached to the 600 hundred silver leaves. The dedication for the Leaves of Life is on February 6, 2009, for the associates and staff. A public dedication will take place at a later date. New Image Ministries' purpose is to declare the works of Jesus Christ so the next generation will know Him.